Whats good or NOT good for your bird to eat? The Non-Toxic and Toxic wood list is thanks to Mario D. Vaden: M. D. Vaden - Trees & Landcapes. Make sure that all apple, orange and other seeds are removed before letting your birds eat the fresh foods. And make sure you wash all fruits and vegetable thoroughly. It's always best to go organic for your parrots to stay away from pesticides. Again, make sure vegetables are washed and preferably organic. The chemicals they feed the plants will harm you and your birds. Avoid anything high is salt, sugar, and fat content. Chocolate poisoning first affects a bird's digestive system, causing vomiting and diarrhea. As the condition progresses, the bird's central nervous system is affected, first causing seizures and eventually death. Believe it or not, apples - along with other members of the rose family including cherries, peaches, apricots, and pears - contain trace amounts of Cyanide within their seeds. While the fruit of the apple is fine for your bird, be aware that in addition to the poisonous seeds, there may be pesticides present on the fruit's skin. Be sure to thoroughly cleanse and core any apple pieces that you share with your bird to avoid exposure to these toxins. The skin and pit of this popular fruit had been known to cause cardiac distress and eventual heart failure in pet bird species. Although there is some debate to the degree of toxicity of avocados, it is generally advised to adopt a "better safe than sorry" attitude toward them and keep guacamole and other avocado products as far away from pet birds as possible. While the use of limited amounts of onion or garlic powders as flavorings is generally regarded as acceptable, excessive consumption of onions causes vomiting, diarrhea, and a host of other digestive problems. It has been found that prolonged exposure can lead to a blood condition called hemolytic anemia, which is followed by respiratory distress and eventual death. Although responsible bird owners would never dream of offering their pet an alcoholic drink, there have been instances in which free roaming birds have attained alcohol poisoning through helping themselves to unattended cocktails. Alcohol depresses the organ systems of birds and can be fatal. Make sure that your bird stays safe by securing him in his cage whenever alcohol is served in your home. Mushrooms are a type of fungus, and have been known to cause digestive upset in companion birds. Caps and stems of some varieties can induce liver failure. Tomatoes, like potatoes and other nightshades, have a tasty fruit that is fine when used as a treat for your bird. The stems, vines, and leaves, however, are highly toxic to your pet. Make sure that any time you offer your bird a tomato treat it has been properly cleaned and sliced, with the green parts removed, so that your bird will avoid exposure to any toxins. While all living beings need regulated amounts of sodium in their systems, too much salt can lead to a host of health problems in birds, including excessive thirst, dehydration, kidney dysfunction, and death. Be sure to keep watch over the amount of salty foods your bird consumes. Caffeinated beverages such as soda, coffee, and tea are popular among people - but allowing your bird to indulge in these drinks can be extremely hazardous. Caffeine causes cardiac malfunction in birds, and is associated with increased heartbeat, arrhythmia, hyper activity, and cardiac arrest. Share a healthy drink of pure fruit or vegetable juice with your bird instead - this will satisfy both your bird's taste buds and nutritional requirements. 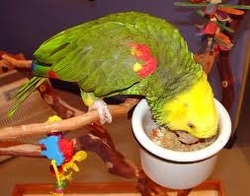 Cooked beans are a favorite treat of many birds, but raw, dry bean mixes can be extremely harmful to your pet. Uncooked beans contain a poison called hemaglutin which is very toxic to birds. To avoid exposure, make sure to thoroughly cook any beans that you choose to share with your bird. Fatty foods High fat in the diet leads to obesity and may result in lipomas (fatty tumors), lipemia (fat in the blood), and hepatic lipidosis (fatty liver disease). Any greasy, oily or otherwise fatty food should be avoided. Commonly overfed fatty foods include nuts, French fries, crackers, marbled meat, peanut butter, butter, fried chicken, fried anything etc. Sugar foods Obviously, frosting is high in sugar and an undesirable foodstuff. Similarly, soda pop, candy and these types of foods are not recommended. Dairy Birds lack the digestive enzymes needed to break down milk sugar and milk proteins. Uncultured milk products such as milk, cream and butter should not be fed but yogurt, cheeses and dried milk can be supplemented in the diet in moderation (they are also high in fat). Lettuce A typical filler food, lettuce is low in everything except water. It is not recommended as a food supplement since it offers little, if anything, for the bird. If leafy foods are desired by your bird, try feeding spinach, collard greens, tops of bok choy, carrot tops or kale. Avocado Although higher in fat than other veggies and used in other countries to condition birds for breeding, avocado has been shown to be toxic in some birds and its feeding is no longer recommended, as mentioned above in the Toxic Foods list.